Windows AMIs for Windows Server 2012 R2 and earlier include an optional service, the EC2Config service (EC2Config.exe). EC2Config starts when the instance boots and performs tasks during startup and each time you stop or start the instance. EC2Config can also perform tasks on demand. Some of these tasks are automatically enabled, while others must be enabled manually. Although optional, this service provides access to advanced features that aren't otherwise available. This service runs in the LocalSystem account. EC2Launch replaces EC2Config on Windows AMIs for Windows Server 2016 and later. For more information, see Configuring a Windows Instance Using EC2Launch. EC2Config uses settings files to control its operation. You can update these settings files using either a graphical tool or by directly editing XML files. The service binaries and additional files are contained in the %ProgramFiles%\Amazon\EC2ConfigService directory. Set a random, encrypted password for the administrator account. Dynamically extend the operating system partition to include any unpartitioned space. Execute the specified user data (and Cloud-Init, if it's installed). For more information about specifying user data, see Working with Instance User Data. Change the host name to match the private IP address in Hex notation (this task is disabled by default and must be enabled in order to run at instance start). Configure the key management server (AWS KMS), check for Windows activation status, and activate Windows as necessary. Mount all Amazon EBS volumes and instance store volumes, and map volume names to drive letters. Write event log entries to the console to help with troubleshooting (this task is disabled by default and must be enabled in order to run at instance start). Write to the console that Windows is ready. Add a custom route to the primary network adapter to enable the following IP addresses when multiple NICs are attached: 169.254.169.250, 169.254.169.251, and 169.254.169.254. These addresses are used by Windows Activation and when you access instance metadata. Display wallpaper information to the desktop background. Run Sysprep and shut down the instance so that you can create an AMI from it. For more information, see Create a Standard Amazon Machine Image Using Sysprep. You can manage the EC2Config service just as you would any other service. To apply updated settings to your instance, you can stop and restart the service. If you're manually installing EC2Config, you must stop the service first. Launch and connect to your Windows instance. In the list of services, right-click EC2Config, and select Stop. In the list of services, right-click EC2Config, and select Restart. If you don't need to update the configuration settings, create your own AMI, or use Amazon EC2 Systems Manager (SSM), you can delete and uninstall the service. Deleting a service removes its registry subkey. Uninstalling a service removes the files, the registry subkey, and any shortcuts to the service. On the list of programs, select EC2ConfigService, and click Uninstall . The EC2Config service processes Systems Manager requests on instances created from AMIs for versions of Windows Server prior to Windows Server 2016 that were published before November 2016. Instances created from AMIs for versions of Windows Server prior to Windows Server 2016 that were published after November 2016 include the EC2Config service and SSM Agent. EC2Config performs all of the tasks described earlier, and SSM Agent processes requests for Systems Manager capabilities like Run Command and State Manager. You can use Run Command to upgrade your existing instances to use to the latest version of the EC2Config service and SSM Agent. For more information, see Example: Update the SSM Agent in the AWS Systems Manager User Guide. The EC2Config service runs Sysprep, a Microsoft tool that enables you to create a customized Windows AMI that can be reused. When EC2Config calls Sysprep, it uses the files in %ProgramFiles%\Amazon\EC2ConfigService\Settings to determine which operations to perform. You can edit these files indirectly using the Ec2 Service Properties dialog box, or directly using an XML editor or a text editor. However, there are some advanced settings that aren't available in the Ec2 Service Properties dialog box, so you must edit those entries directly. If you create an AMI from an instance after updating its settings, the new settings are applied to any instance that's launched from the new AMI. For information about creating an AMI, see Creating a Custom Windows AMI. The following procedure describes how to use the Ec2 Service Properties dialog box to enable or disable settings. From the Start menu, click All Programs, and then click EC2ConfigService Settings. On the General tab of the Ec2 Service Properties dialog box, you can enable or disable the following settings. If this setting is enabled (it is disabled by default), the host name is compared to the current internal IP address at each boot; if the host name and internal IP address do not match, the host name is reset to contain the internal IP address and then the system reboots to pick up the new host name. To set your own host name, or to prevent your existing host name from being modified, do not enable this setting. User data execution enables you to specify scripts in the instance metadata. By default, these scripts are run during the initial launch. You can also configure them to run the next time you reboot or start the instance, or every time you reboot or start the instance. If you have a large script, we recommend that you use user data to download the script, and then execute it. For more information, see User Data Execution. Use this setting to display event log entries on the console during boot for easy monitoring and debugging. Click Settings to specify filters for the log entries sent to the console. The default filter sends the three most recent error entries from the system event log to the console. Use this setting to display system information on the desktop background. The following is an example of the information displayed on the desktop background. The information displayed on the desktop background is controlled by the settings file EC2ConfigService\Settings\WallpaperSettings.xml. Use this setting to allow EC2 to signal the operating system to perform hibernation. Click the Storage tab. You can enable or disable the following settings. This setting dynamically extends Disk 0/Volume 0 to include any unpartitioned space. This can be useful when the instance is booted from a root device volume that has a custom size. This setting formats and mounts all volumes attached to the instance during start. The system maps the volumes attached to an instance to drive letters. For Amazon EBS volumes, the default is to assign drive letters going from D: to Z:. For instance store volumes, the default depends on the driver. Citrix PV drivers assign instance store volumes drive letters going from Z: to A:. Red Hat drivers assign instance store volumes drive letters going from D: to Z:. To choose the drive letters for your volumes, click Mappings. 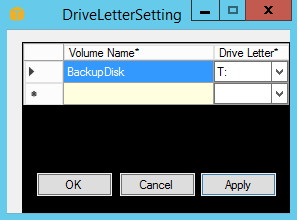 In the DriveLetterSetting dialog box, specify the Volume Name and Drive Letter values for each volume, click Apply, and then click OK. We recommend that you select drive letters that avoid conflicts with drive letters that are likely to be in use, such as drive letters in the middle of the alphabet. After you specify a drive letter mapping and attach a volume with same label as one of the volume names that you specified, EC2Config automatically assigns your specified drive letter to that volume. However, the drive letter mapping fails if the drive letter is already in use. Note that EC2Config doesn't change the drive letters of volumes that were already mounted when you specified the drive letter mapping. To save your settings and continue working on them later, click OK to close the Ec2 Service Properties dialog box. If you have finished customizing your instance and want to create an AMI from that instance, see Create a Standard Amazon Machine Image Using Sysprep. ActivationSettings.xml—Controls product activation using a key management server (KMS). AWS.EC2.Windows.CloudWatch.json—Controls which performance counters to send to CloudWatch and which logs to send to CloudWatch Logs. For more information about how to change the settings in this file, see Sending Logs, Events, and Performance Counters to Amazon CloudWatch. BundleConfig.xml—Controls how EC2Config prepares an instance store-backed instance for AMI creation. EventLogConfig.xml—Controls the event log information that's displayed on the console while the instance is booting. WallpaperSettings.xml—Controls the information that's displayed on the desktop background. This file contains settings that control product activation. When Windows boots, the EC2Config service checks whether Windows is already activated. If Windows is not already activated, it attempts to activate Windows by searching for the specified KMS server. SetAutodiscover—Indicates whether to detect a KMS automatically. TargetKMSServer—Stores the private IP address of a KMS. The KMS must be in the same region as your instance. DiscoverFromZone—Discovers the KMS server from the specified DNS zone. ReadFromUserData—Gets the KMS server from UserData. LegacySearchZones—Discovers the KMS server from the specified DNS zone. DoActivate—Attempts activation using the specified settings in the section. This value can be true or false. LogResultToConsole—Displays the result to the console. This file contains settings that control how EC2Config prepares an instance for AMI creation. AutoSysprep—Indicates whether to use Sysprep automatically. Change the value to Yes to use Sysprep. SetRDPCertificate—Sets a self-signed certificate to the Remote Desktop server. This enables you to securely RDP into the instances. Change the value to Yes if the new instances should have the certificate. This setting is not used with Windows Server 2008 or Windows Server 2012 instances because they can generate their own certificates. SetPasswordAfterSysprep—Sets a random password on a newly launched instance, encrypts it with the user launch key, and outputs the encrypted password to the console. Change the value of this setting to No if the new instances should not be set to a random encrypted password. Ec2SetPassword—Generates a random encrypted password each time you launch an instance. This feature is disabled by default after the first launch so that reboots of this instance don't change a password set by the user. Change this setting to Enabled to continue to generate passwords each time you launch an instance. This setting is important if you are planning to create an AMI from your instance. Ec2SetComputerName—Sets the host name of the instance to a unique name based on the IP address of the instance and reboots the instance. To set your own host name, or prevent your existing host name from being modified, you must disable this setting. Ec2InitializeDrives—Initializes and formats all volumes during startup. This feature is enabled by default. Ec2EventLog—Displays event log entries in the console. By default, the three most recent error entries from the system event log are displayed. To specify the event log entries to display, edit the EventLogConfig.xml file located in the EC2ConfigService\Settings directory. For information about the settings in this file, see Eventlog Key in the MSDN Library. Ec2ConfigureRDP—Sets up a self-signed certificate on the instance, so users can securely access the instance using Remote Desktop. This feature is disabled on Windows Server 2008 and Windows Server 2012 instances because they can generate their own certificates. Ec2OutputRDPCert—Displays the Remote Desktop certificate information to the console so that the user can verify it against the thumbprint. Ec2SetDriveLetter—Sets the drive letters of the mounted volumes based on user-defined settings. By default, when an Amazon EBS volume is attached to an instance, it can be mounted using the drive letter on the instance. To specify your drive letter mappings, edit the DriveLetterConfig.xml file located in the EC2ConfigService\Settings directory. 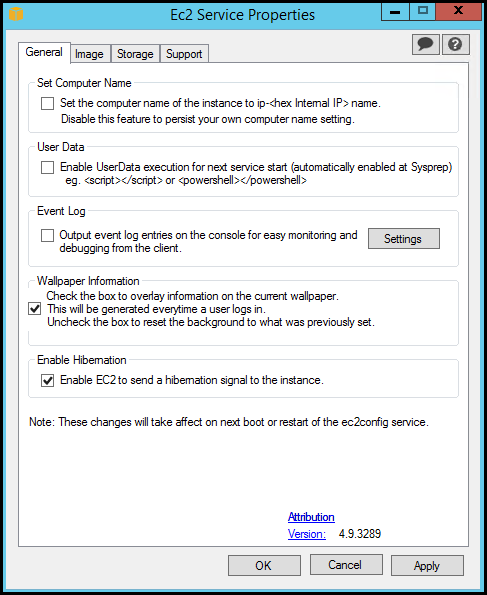 Ec2WindowsActivate—The plug-in handles Windows activation. It checks to see if Windows is activated. If not, it updates the KMS client settings, and then activates Windows. To modify the KMS settings, edit the ActivationSettings.xml file located in the EC2ConfigService\Settings directory. Ec2DynamicBootVolumeSize—Extends Disk 0/Volume 0 to include any unpartitioned space. Ec2HandleUserData—Creates and executes scripts created by the user on the first launch of an instance after Sysprep is run. Commands wrapped in script tags are saved to a batch file, and commands wrapped in PowerShell tags are saved to a .ps1 file (corresponds to the User Data check box on the Ec2 Service Properties dialog box). Ec2ElasticGpuSetup—Installs the Elastic GPU software package if the instance is associated with an elastic GPU. Ec2FeatureLogging—Sends Windows feature installation and corresponding service status to the console. Supported only for the Microsoft Hyper-V feature and corresponding vmms service. ManageShutdown—Ensures that instances launched from instance store-backed AMIs do not terminate while running Sysprep. SetDnsSuffixList—Sets the DNS suffix of the network adapter for Amazon EC2. This allows DNS resolution of servers running in Amazon EC2 without providing the fully qualified domain name. WaitForMetaDataAvailable—Ensures that the EC2Config service will wait for metadata to be accessible and the network available before continuing with the boot. This check ensures that EC2Config can obtain information from metadata for activation and other plug-ins. ShouldAddRoutes—Adds a custom route to the primary network adapter to enable the following IP addresses when multiple NICs are attached: 169.254.169.250, 169.254.169.251, and 169.254.169.254. These addresses are used by Windows Activation and when you access instance metadata. RemoveCredentialsfromSyspreponStartup—Removes the administrator password from Sysprep.xml the next time the service starts. To ensure that this password persists, edit this setting. This file contains settings that control drive letter mappings. 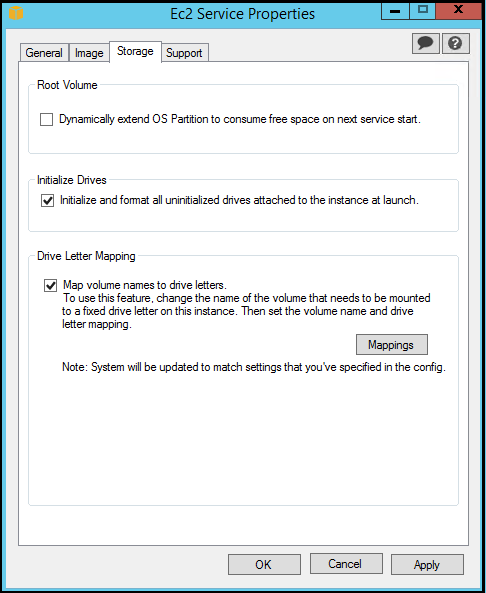 By default, a volume can be mapped to any available drive letter. You can mount a volume to a particular drive letter as follows. VolumeName—The volume label. For example, My Volume. To specify a mapping for an instance storage volume, use the label Temporary Storage X, where X is a number from 0 to 25. DriveLetter—The drive letter. For example, M:. The mapping fails if the drive letter is already in use. This file contains settings that control the event log information that's displayed on the console while the instance is booting. By default, we display the three most recent error entries from the System event log. Category—The event log key to monitor. NumEntries—The number of events stored for this category. LastMessageTime—To prevent the same message from being pushed repeatedly, the service updates this value every time it pushes a message. AppName—The event source or application that logged the event. This file contains settings that control the information that's displayed on the desktop background. The following information is displayed by default. Instance ID—Displays the ID of the instance. Public IP Address—Displays the public IP address of the instance. Private IP Address—Displays the private IP address of the instance. Availability Zone—Displays the Availability Zone in which the instance is running. Instance Size—Displays the type of instance. Architecture—Displays the setting of the PROCESSOR_ARCHITECTURE environment variable. You can remove any of the information that's displayed by default by deleting its entry. You can add additional instance metadata to display as follows. You can add additional System environment variables to display as follows. This file contains settings that control how EC2Config initializes drives. By default, EC2Config initialize drives that were not brought online with the operating system. You can customize the plugin as follows. Enables the TRIM command when formatting drives. After a drive has been formatted and initialized, the system restores TRIM configuration. Starting with EC2Config version 3.18, the TRIM command is disabled during the disk format operation by default. This improves formatting times. Use this setting to enable TRIM during the disk format operation for EC2Config version 3.18 and later. Disables the TRIM command when formatting drives and improves formatting times in Windows. After a drive has been formatted and initialized, the system restores TRIM configuration. Disables formatting for new drives. Use this setting to initialize drives manually. You can configure the EC2Config service to communicate through a proxy using one of the following methods: the AWS SDK for .NET, the system.net element, or Microsoft Group Policy and Internet Explorer. Using the AWS SDK for .NET is the preferred method because you can specify a user name and password. You can configure proxy settings for the EC2Config service by specifying the proxy element in the Ec2Config.exe.config file. For more information, see Configuration Files Reference for AWS SDK for .NET. Edit the Ec2Config.exe.config file on an instance where you want the EC2Config service to communicate through a proxy. By default, the file is located in the following directory: %ProgramFiles%\Amazon\Ec2ConfigService. Add the following aws element to the configSections. Do not add this to any existing sectionGroups. Add the following aws element to the Ec2Config.exe.config file. You can specify proxy settings in a system.net element in the Ec2Config.exe.config file. For more information, see defaultProxy Element (Network Settings) on MSDN. Add a defaultProxy entry to system.net. For more information, see defaultProxy Element (Network Settings) on MSDN. For example, the following configuration routes all traffic to use the proxy that is currently configured for Internet Explorer, with the exception of the metadata and licensing traffic, which will bypass the proxy. The EC2Config service runs under the Local System user account. You can specify instance-wide proxy settings for this account in Internet Explorer after you change Group Policy settings on the instance. On an instance where you want the EC2Config service to communicate through a proxy, open a Command prompt as an Administrator, type gpedit.msc, and press Enter. In the Local Group Policy Editor, under Local Computer Policy, choose Computer Configuration, Administrative Templates, Windows Components, Internet Explorer. In the right-pane, choose Make proxy settings per-machine (rather than per-user) and then choose Edit policy setting. Choose Enabled, and then choose Apply. Open Internet Explorer, and then choose the Tools button. Choose Internet Option, and then choose the Connections tab. Under Proxy server, choose the Use a proxy server for your LAN option. Specify address and port information and then choose OK.